As an Affiliate Manager I am always on the lookout for new online partners, especially content sites ranking high, organically for search terms related to the products that I am marketing. I am a fan of coupon and loyalty web sites for reaching the masses, however there is nothing better than a strong niche publisher to bring high quality traffic and sales in. In late 2013 I tested a new channel to recruit affiliates and had great success with it. FACEBOOK, Yes Facebook. I was surprised at this myself. If you are in a niche vertical, type in the keyword for your industry on Facebook and you will find many pages set up devoted to enthusiasts of your product or vertical. Many of the Facebook page owners are looking to monetize their posts with affiliate marketing revenue. The big affiliate networks like Commission Junction and LinkShare have many Facebook page publishers joined already, so you may not even have to convince them to sign-up to a network if that is where you manage your affiliate program. In doing my initial prospecting research, I always make sure that the Facebook page has an engaged audience, and I can check this quickly by glancing at the “talking about this” number published on the Facebook page. Make sure this number is relatively high as a percentage of total “likes”. This shows that the fans are active in reading the site and are participating in conversations. There are so many Facebook pages buying or creating fake likes, and I want to make sure that the fans are genuinely interested in the topic. 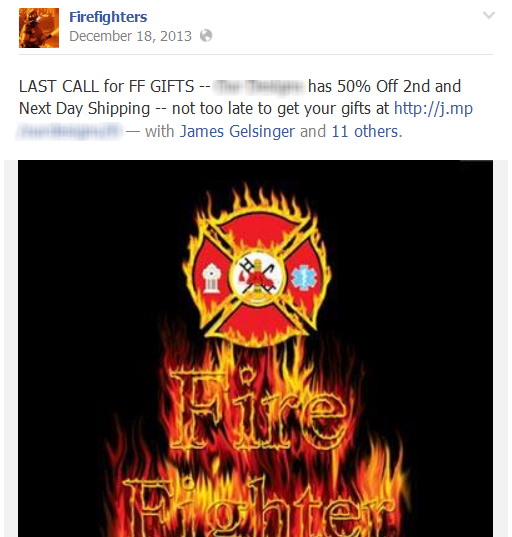 In 2013 I learned this first-hand about the power of Facebook page owners while I was managing a client in the very specific niche of selling products targeted at Firefighters and EMT’s. Recruiting is a numbers game and most importantly, all about timing. If you can hit the web site or Facebook page owner at the right time, and appeal to their senses, they should give you a shot at least willing to test working with you as a merchant. My personal results: This new Facebook affiliate brought in an excellent quality audience that converted! This particular Facebook page is a serious influencer in the industry, and when they post about my products, it is effective in driving visitors to my site that purchase! The average order value and conversion ratio was much higher on average than the other affiliates that I had. It is a win win, the Facebook page owner makes money posting about our new products and seasonal promotions, and I acquire new customers on a pay per performance basis. The side benefit of branding has appeared be effective as well because I have seen a slight increase in conversion with other affiliate marketing partners as a result of teaming with a respected name in the industry. 1) Look for Facebook pages with an engaged audience. Check out the “talking about this” number published on the Facebook page. Make sure this number is relatively high as a percentage of total “likes”. 2) If you are in an industry or vertical with trade publications and associations, these make great partners. 3) Reach out to the Facebook page owner/administrator, if they don’t respond the first time, try again. Contact info is typically found on the “About” area of a Facebook page. 4) Set up a payout that works for both parties. Test in action to see what structure will work for everyone to be profitable. 5) Set up a promotional calendar or list of seasonal promotions that you can create for this partner. 6) If you can create a vanity code or a special promotional code for their visitors to use at check out, this helps with conversion from click to sale. 7) Monitor results closely in your affiliate network or analytics package dashboard.